How many Tra­bant cars are avail­able? We can sup­ply you with a total of 40 Tra­bant cars. This includes up to 6 Tra­bant con­vert­ibles which you can hire from us as well. All cars have a ful­ly com­pre­hen­sive insur­ance with a max­i­mum dam­age deduc­tion of 500 EUR. How many peo­ple fit in a Tra­bant? A max­i­mum of four per­sons per car. We rec­om­mend three par­tic­i­pants per car. 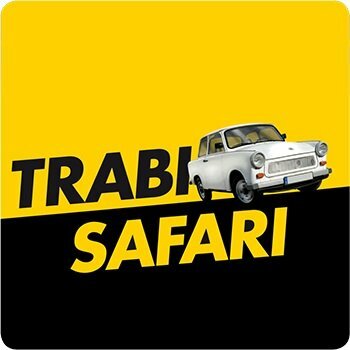 What is a Trabant’s top speed? A Tra­bant can reach 100 km/​h. How­ev­er, we rec­om­mend a top speed of 80 km/​h. At high­er speeds the noise lev­el increas­es. Speeds above 100km/​h can cause severe dam­age to the engine’s cylin­ders which are not cov­ered by our insur­ance. How does the Trabant’s gear shift work? It is a 4-gear steer­ing col­umn gear stick. You’ll get a prop­er intro­duc­tion before the start of your jour­ney. Any­thing else I have to look out for? Make sure that you released the hand­brake before you start your trip. There are no warn­ing sig­nals in case you for­get. Make sure to switch off the lights before leav­ing the car. For more infor­ma­tion please con­tact us here. Thank you very much!